Marc Orfaly: I grew up in a pretty big Armenian and Syrian household. It was a pretty big family get-together every Sunday. So I was always surrounded by great home cooking. My dad is from New York, is really into, like, grilling and he was really into food so I was just constantly being surrounded with great food. It was probably my junior year in high school or so, and I started just to actually cook. We had a family friend that basically was a chef, so they started me as, like, a short-order cook. There was a certain point where it wasn’t just a job anymore. I realized I could add creativity to it. And I just kind of stuck with it from there. BtP: So obviously there was a lot of great food at home. What was the first real memorable dining out experience that made you appreciate the food that could come from a professional kitchen? MO: I guess my first real “Wow“ experience was probably the original Olives on Main Street. I had eaten there a few times when I was probably around 18 or 19. We weren’t really a family that went out to eat a lot. It was kind of almost like an insult to our household, like somebody couldn’t cook at home. So my eating out experience was kind of limited. And I just remembered the first couple of times I ate at Olives I was just completely floored by the food. Like, I had no clue that food could be that goo. So I went to culinary school and then when I graduated I headed back to Boston and I worked at Davio’s for, like, six months. But because of that job, I was able to try out at Olives and I just remember the first thing I tried was … it was a wood fire grill with the broiler and rotisserie and, like, chicken spinning around and I kind of observed the first turn and then they said, “Okay, jump in.” So, I jumped in, like, with no clue what I was doing. [LAUGHS] They kind of told me later that the reason they did hire me originally was because I had no clue what I was doing but I still just jumped in and tried to figure it out anyway. And back then it was Barbara Lynch and me as line cooks and Paul O’Connell was our sous chef and Todd (English) was regularly there. So it was a pretty amazing … looking back on that experience it was pretty amazing. BtP: Not a bad team to have in the kitchen. BtP: Okay. So you went to culinary school at Johnson & Wales. If a young person came to you and asked, you know, “I’m interested in cooking, I would like to get involved.” What would your recommendation be to them? Would it be getting a little bit of experience just to make sure that they feel that they’re really cut out for actually doing the work day in and day out or would culinary school be your recommendation? MO: I mean, the only thing I … I never recommend culinary school. I think I went to culinary school when I was around 18. I think college, in general, is a good rite of passage for someone in their late teens, or who are just about to come into their 20s. It’s a good opportunity to maybe get a taste of a variety of things and really figure out what direction you want to really head in to, you know? All school is trying to do is emulate what you’re going to experience in real time and you end up paying for it. So why not just go where there is real time, real life experience and just work for free? It’s much better training. And you figure out real fast if it’s for you or not, you know. The best part of doing it this way is that if you figure out it isn’t the right thing for you, you didn’t end up dropping a ton of money on school. BtP: That actually brings up a good point. Working in a kitchen can be hard work. Not everyone is cut out for it, whether it’s being able to deal with the long hours or just the tough conditions sometimes that come with it. So what is it about the culinary world and cooking and working in the kitchen that brings you back every day? MO: It’s definitely an exciting career and it encompasses a lot of different things. There’s a business aspect to it that you have to respect. There’s the, you know, the creative and the cooking part of it which is a lot of fun. There are certain parts of it that can be not so fun sometimes, but it’s also part of it. It comes with the territory. MO: But, the business aspect part is great. You know, there’s so many other facets, too. There’s travel, there’s wine, there’s design. It’s not just this monochromatic thing where you’re just doing this one thing. So, for someone like me, it definitely keeps me interested all the time. I think the restaurant industry is continually evolving which is another exciting thing about the business, I feel. BtP: Something new every day. All right, cool… so my last question for you. There are obviously a lot of memories that can get rooted into us from being around food, and cooking. Do you have a particular memory that kind of stands out to you as to why food is such an important part of your life? MO: I would say its probably my grandmother’s cooking on Sundays and it’s just kind of like, I don’t know, maybe just being a curious kid and watching what was going on with all this food. Seeing how it mattered to people. I think that’s why it matters to me. My grandmother was such a great person, and to carry on some of her legacy and the way that she did things. Everything she did was always home scratch cooking, you know? So to kind of continue that legacy on my own. I think it will always be important for me. And I just, I don’t know, there’s something about it. I mean, it has nothing to do with… There are obviously all these reality shows and Top Chef and all this other stuff. Maybe I’m of a different generation, but that type of attention doesn’t really drive me. What drives me is just the love of food and cooking, and I know I got that from my grandmother. 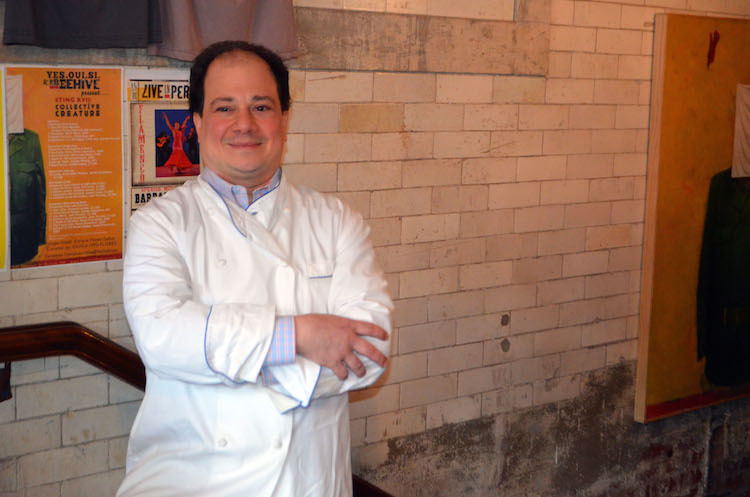 Marc Orfaly is the chef of The Beehive, located at 541 Tremont Street, in Boston MA.